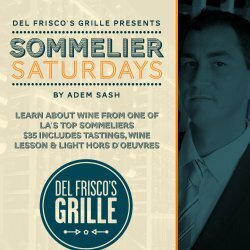 Del Frisco’s Grille Santa Monica continues the monthly wine lesson and tasting event, Sommelier Saturdays, with a selection of red and white wines from the Loire Valley. On Saturday, June 28 from 1-3 p.m., Sommelier Adem Sash will give insight into the region and offer wine and food pairings to bring out bold flavors. For $35, attendees will receive a two-hour wine lesson from one of LA’s top sommeliers, along with hors d’oeuvres. Del Frisco’s Grille is located on the corner of Ocean Ave. and Colorado Blvd, and valet parking is available adjacent to restaurant for $8 with validation. Reservations can be made by calling: (310) 395-7333.